Once the only way to transport a family, the wagon has been the subject of declining interest in America over the last couple of decades. The Buick Roadmasters of the world were sidelined by Dodge Caravans, then just as quickly, Ford Explorers and a slew of crossover SUVs took over as the dominant family movers. Memories of wood side panels and wallowy drive characteristics don’t help the wagon’s cause over here either. Yet, in Europe, wagons are as popular as ever, meaning that the Germans and Swedes are the only ones offering vehicles with a low-slung stance, hatchback rear and plenty of cargo space. That is, until now. 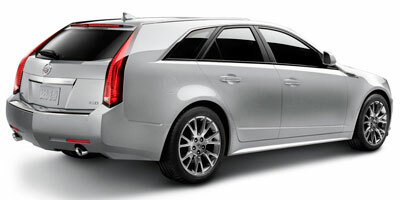 The all-new 2010 Cadillac CTS Sport Wagon is attempting to do what the Dodge Magnum couldn’t – generate wagon sales for an American car company. They’ve chosen a great platform from which to start – the angular CTS is a monumental sales success, after all – and filled the car with impressive luxury goodies, not to mention provided a number of trim levels to suit an array of buyers. Of course, you can always hold out for the CTS-V Sport Wagon if the throaty roar of a V-8 is more likely to tickle your fancy. We love that the wagon body style adds another dimension to the Cadillac lineup and provides buyers with an American option. 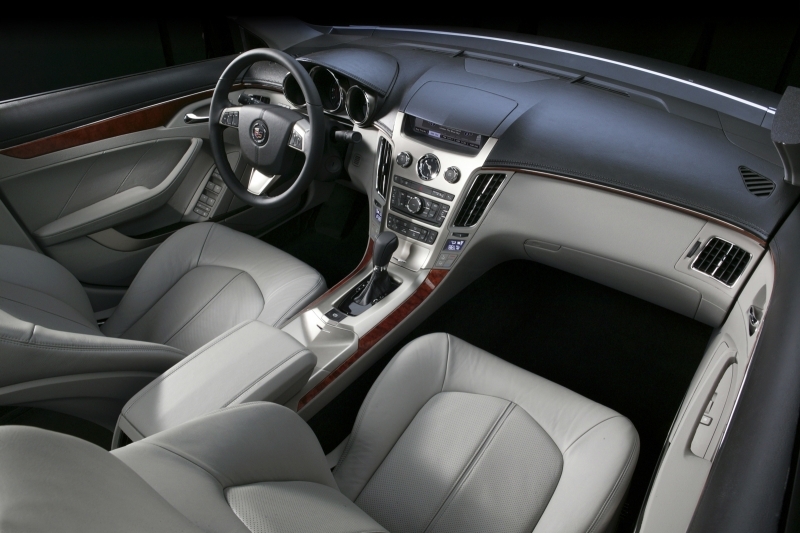 Soft-touch, luxurious materials run throughout the cabin, and the leather seats are more than comfortable. Availability of rear-wheel or all-wheel drive makes the V6 Premium a more competitive buy, as does the base price of $48,665. While there’s plenty of space in the rear, headroom in the back seats is limited and taller adults won’t be comfortable. 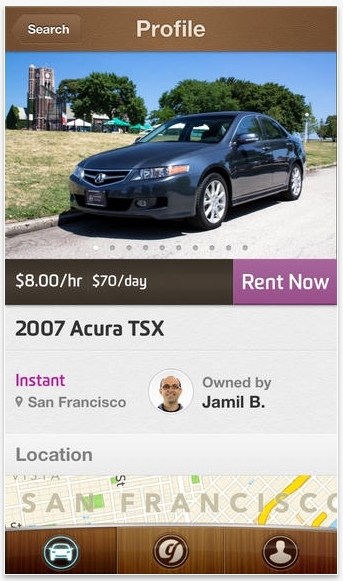 The touch screen, while responsive and good looking, is a little too far away from the driver. Performance is slightly compromised by the weight gain that comes with the D-pillar addition. 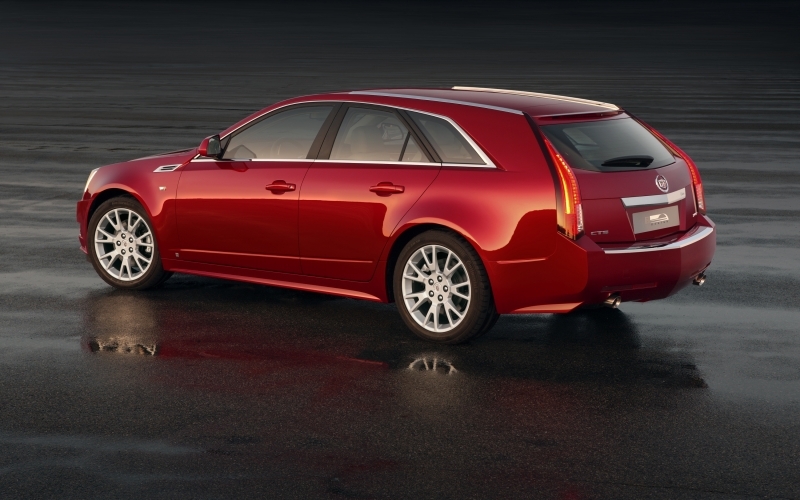 The CTS Sport Wagon retains many of the excellent drive characteristics first introduced in the sedan, including fantastic brakes, direct and well-weighted steering and handling that continues to prove itself during spirited driving. Undoubtedly, the sport wagon isn’t as fast as the sedan, but it’s not so much that the 3.6-liter engine can’t handle the extra 200 lbs once on the move – it certainly can – it’s just that the Caddy seems to take that tiny bit longer to deliver power. But power it does have, with the 3.6-liter greatly outperforming the 3.0-liter available in other trims. While the transmission is great, the German competition still has the quicker shifts. The additional weight has created an odd improvement though – the weight distribution feels better, especially during cornering, and the wagon feels very level in turns, which is great news for the kids in the back. With large rear pillars, visibility is a bit limited, but there’s a nice, optional rearview camera to remedy that problem. While the CTS has two different engines available, including a 3.0-liter V6, this particular trim features the 3.6-liter direct injection V-6, which produces 304 horsepower and 273 lb-ft of torque. 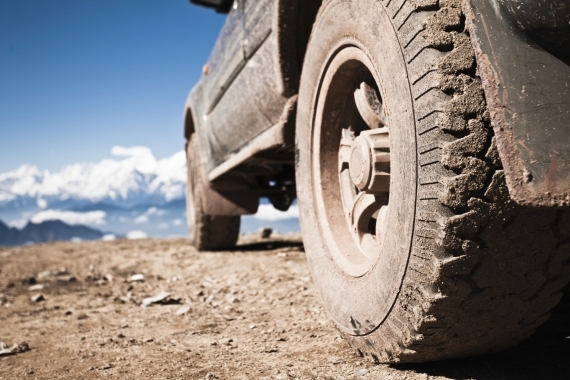 All models have the option of all-wheel drive or rear-wheel drive and standard for the Premium is a locking rear differential and a six-speed automatic. As the wagon has a fairly tight cabin space, the standard panoramic sunroof is a huge selling point, especially for those used to the high roofline of an SUV. Also standard in this top-of-the-line trim is cruise control, dual-zone climate control, a tilting/telescoping steering wheel, lumbar support, heated seats and OnStar. 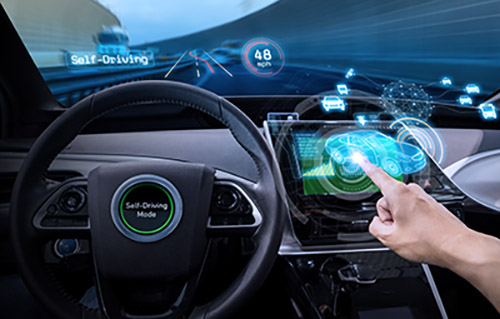 More techy standards include Bluetooth connectivity and USB and auxiliary input jacks. Features like the remote trunk release and keyless start are pretty cool, but the technology highlights come from the standard navigation system with traffic and weather updates, rear park assist and a rearview camera. A fantastic Bose surround-sound 10-speaker audio system with 40GB hard drive should satisfy you audiophiles out there. In AWD or RWD, the fuel consumption numbers remain the same for the sport wagon at 18 mpg city and 26 mpg highway. These are very similar to the competition, which only varies by one or two mpg. Polished wood trim and chrome finishes add sophistication to the interior space, and leather bucket seats allow for sumptuous comfort. The navigation screen rises up from the center of the instrument panel when you need it and mp3 players tuck neatly away into the center console storage area. 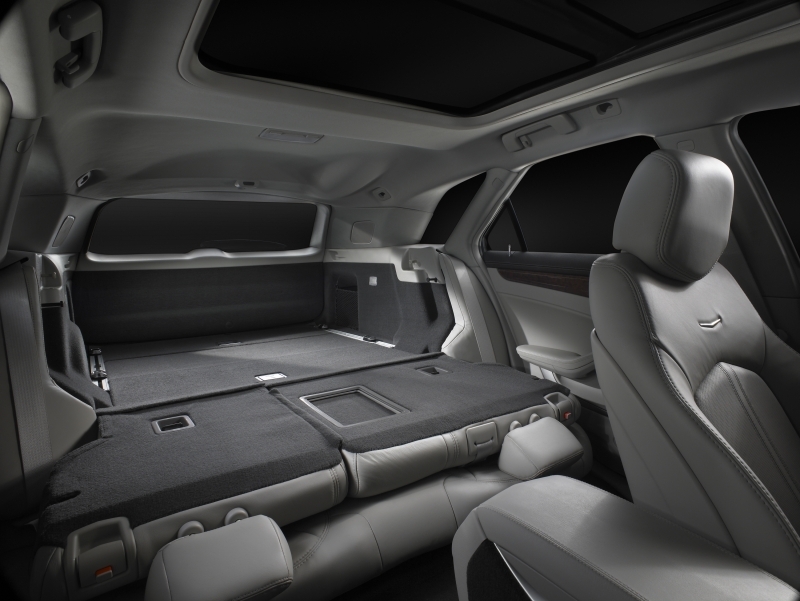 There are a number of unexpected surprises in the CTS wagon as well, including fold-flat rear seats and under-floor storage, to help corral your possessions. The wagon is still a CTS from the rear pillars forward; the end has been extended to accommodate a liftgate and extra storage room. 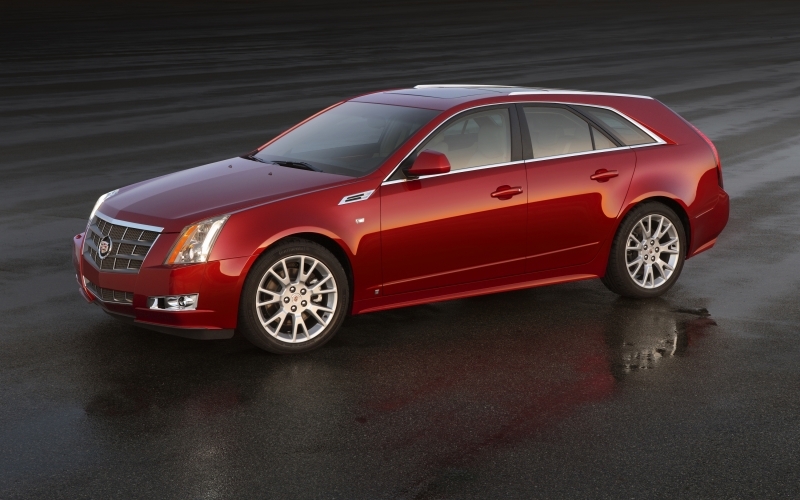 CTS styling is all about angles and attention-getting looks. The large front grille and crest, chrome accents and trapezoid lights make this aggressive wagon unlike any other on the market. Coming in at $48,665 for rear-wheel drive and $50,565 for all-wheel drive, the 3.6L V-6 Premium trim strikes us as a good bargain compared to the competition, which is mainly the $55,950 BMW 335i Sports Wagon and $53,310 Audi A6 Avant. If that’s too rich for your blood, be sure to look at the base sport wagon, at $38,265 in RWD and $40,165 for AWD. The wagon is still a foreign concept to Americans, despite car makers’ attempts to improve its standing. We think that the Cadillac CTS Sport Wagon is the first American to challenge our dated preconceptions of these versatile machines. It has the looks, interior comfort, tech features and – more importantly – price to win over SUV and crossover devotees. And with a ride that’s more sport sedan than minivan, it might even make you forgot those family trips in the ol’ Roadmaster.